An employee may enter several rows for the same date to log the different amount of time with respect to the specific project. is less than 8 (3 + 1 + 2)? Choose "Format" from the menu, then "Conditional formatting..." from the dropdown. 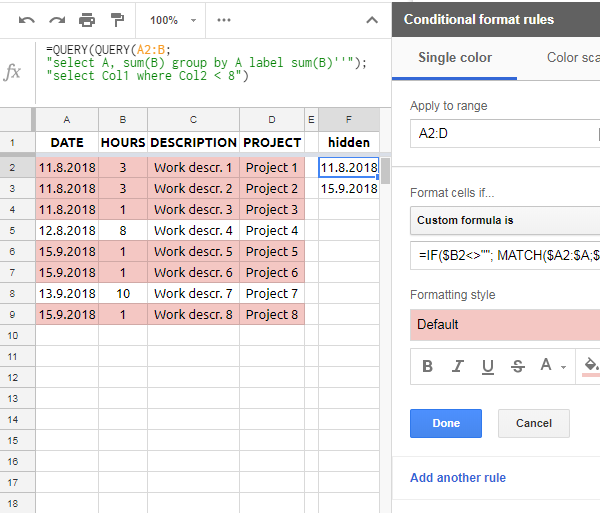 When the conditional formatting dialog appears, change the "Apply to range" value from "B2" to "B2:B"
Under "Format cells if...," open the drop-down menu, scroll to the bottom and choose "Custom formula is..."
Use the tools in the "Formatting style" area to choose your "warning" formatting (e.g., red background with bold text, or white background with bold red text, etc.). Close the conditional formatting dialog.